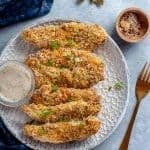 Oven baked chicken tenders with panko are a simple and easy way to enjoy healthy crispy breaded golden chicken that’s low fat yet full of flavour. Served with a homemade creamy dipping sauce free from refined sugar and paired with a garden salad and rough cut homemade baked chips. Preheat oven to 180 degrees C, or 320 F.
In a mixing bowl, crack the eggs, add the flour, soy sauce and pinch of salt and pepper. Whisk until combined and smooth. On a large plate, or large bowl, place the panko, garlic salt, rosemary, oregano, basil, and parmesan. Use a fork to mix through evenly combined. Dip one tenderloin at a time into the egg wash, and press into the panko both sides. Dip into the egg wash again, and press into the panko both sides again. I call this a double crumb, but you can do just the one if you want. Repeat the process until all tenders have been egg washed and coated in panko. As the tenders are coated in panko, place them on a lined baking tray. Bake the chicken tenders in the oven at 180 degrees C, or 320 degrees C for 25 minutes. Creamy Dipping Sauce: Add all the ingredients to a bowl and whisk until combined, or put it all into a jar with a tight lid and shake it like you made it. Serve with creamy dipping sauce and a salad and chips.